It's still hot here despite feeling like the beginning of Fall. What does that mean from a culinary perspective? It means that we still eat a lot of meals outside like it's summer, but its not too hot to use the oven, and those more wintery means of preparation start to sound appealing. You know, like braising or roasting. Last week I wanted something hardier than a green salad for dinner, but something that was quick to prepare and could make a one-dish dinner. I roasted some potatoes and boiled a couple of eggs and mixed up a slightly more Fall-like version of a classic potato salad. Because it had multiple variations of lemon-- preserved, fresh juice, and lemon balm-- it still tasted summery too. It was delicious, so I jotted down the recipe to share. Lemony Roasted Potato Salad (Makes 4 generous servings). Toss cubed potatoes with enough of the olive oil to lightly coat it, reserve the rest of the oil for the dressing. Toss in the preserved lemon rind, rosemary, salt and pepper and spread on a cookie sheet lined with parchment paper. Roast in a 425° F oven for 25-30 minutes, or until potatoes are browned but not too crunchy. 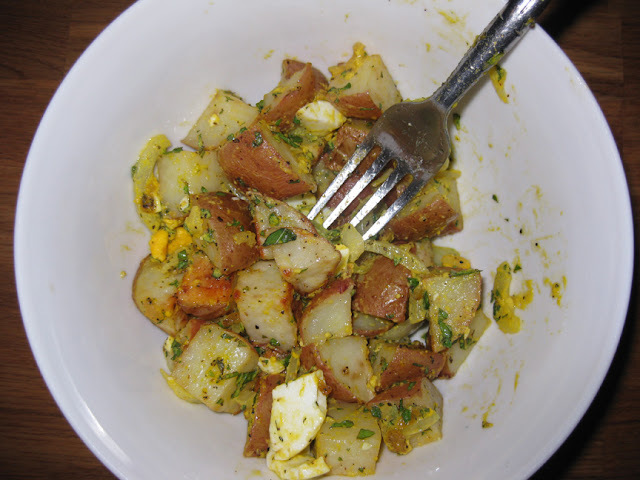 In a bowl combine roasted potatoes, chopped eggs, fresh herbs, lemon juice and remaining olive oil and toss well. Serve slightly warm. Lemon balm isn't an herb that I use very often, but I planted some this spring and it seemed like a good fit here. My go to herbs from the garden are mint, tarragon, basil, garlic chives and rosemary. Oh, and I like lavender sometimes especially for baking. I expanded my herb garden this year to include marjoram, oregano, sorrel, pineapple sage (really good in lemonade), and lemon balm, but I haven't yet got in the habit of using those herbs regularly. What herbs do you grow, and which do you find yourself using all the time? If not just use all mint, it would be just as good. Too bad I can't fed-ex you some.